Tango in the Spring is a celebration of social dancing, and with people coming from all around Australia, plus New Zealand and Buenos Aires, we are excited! We want you to help make these milongas a truly magical social experience. While the embrace between a couple is at the core of Argentine tango, the true magic of social dancing in a milonga is that the sum is greater than its parts. Dancing together in the ronda, with couples moving together to the music, we create an even more powerful experience. Many an experienced milonguero will tell you that their best tango moments come when they feel connected to the other couples around them, as though in a whimsical musical conspiracy with the other leaders, the whole milonga dancing as one. If you haven’t had this experience before, we invite you to try at Tango in the Spring! So how do we create that greater magic? Appreciating the power of floorcraft can help! 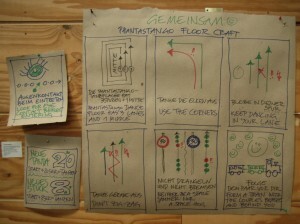 For leaders, the floorcraft to help the milonga magic is very simple, and very difficult at the same time. The core is awareness and sensitivity – to your partner, to the other couples on the floor, and to the music. This is not easy, and is difficult to learn. But there are some simple rules of thumb which make a big difference. Most people know that social tango is always danced in a ronda, a large wheel of dancing couples that slowly rotates during the dance. What this means is that you dance with your partner, of course, but you will also be dancing with the couple immediately in front of you and immediately behind you! Each couple dances within their space in the ronda, and slowly progresses, following the train of the ronda. The speed will depend on the particular milonga, the people present, the music, and the mood. It is wonderful to perceive the energy of the ronda and find your own dance within that larger dance. To do this, at the very least you need to be aware of the couples in front and behind. Feel the place between those two couples, and try to dance within it. If everyone is dancing well, there will be no need to overtake the folk in front, or to step out of the line of dance into the centre of the room. And the folk behind will have the same feeling, they will be comfortable and happy following you in the ronda and have no need to step out of it or try to overtake. Once you are able to dance with awareness of the couples around you, almost all navigational problems will start to disappear naturally. The most important thing you can do to help the magic is to be compact: don’t lift your feet off the floor unless there is a very, very clear indication from the leader that you should. You shouldn’t be responsible for navigating, so you don’t need to know what space is available behind you or around you – in fact you have the privilege of dancing with your eyes closed if you want to! With your feet low and no unprovoked large movements, you can’t go far wrong. But if the leader is leading things that you know are unsafe, then just don’t do them! Good floorcraft from every person on the floor can open a doorway to tango bliss that is otherwise much harder to find. 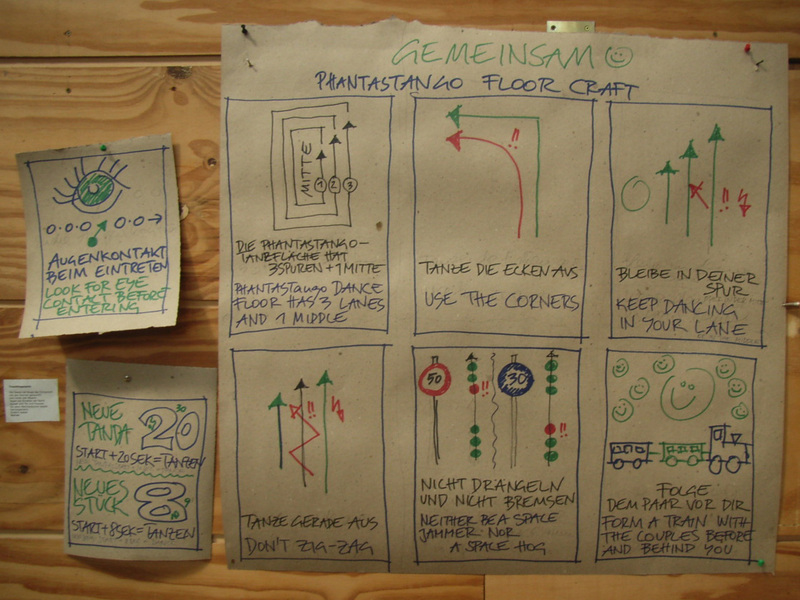 The reverse is also true – if the milonga is chaotic, navigating the floor can become stressful. The leader’s anxiety is in turn transmitted to each follower, making it difficult or even unwise for them to relax and give their trust. So friends, let’s all make a pact to create magic together in the milongas this weekend, leaving chaos behind and connecting to the music together!